Rajkumar Rao's 'Mental Hai Kia' release due to Kangana Runout? For a long time, Kangana Ranaut and Rajkumar Rao's movie 'Mental Hey' are being awaiting for a long time. However, now the news is that the film's release has been postponed. It is also news that this is due to Kangna. Rajkumar Rao and Kangana Ranaut had previously appeared in the 2014 superhit movie 'Queen'. His chemistry was very liked in the film. Now this couple is ready to entertain the audience once again in the movie 'Mental Hai Kia'. It is a black comedy film which was supposed to be released on March 29 first. It is now being told that the release of the film has been postponed on the request of Kangna Runaut. According to media reports, Kangna says that there should be some difference between the release of her last film Manikarnika and upcoming movie 'Mental Hail Ki'. If it was released on March 29, it would have been released exactly 2 months after 'Manikarnika', due to which he would have to immediately get promoted in the film. That's why Kangana has told the makers that they should get the time to get at least a little breath. 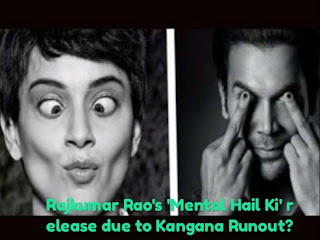 movie review , Rajkumar Rao Kangana Runouts 'Mental Hai Kia.